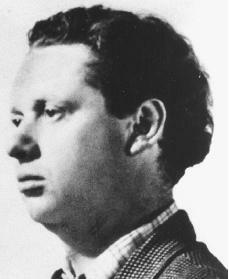 The Welsh poet Dylan Thomas has been hailed as one of the most important poets of the century. His lyrics rank among the most powerful and captivating of modern poetry. Dylan Marlais Thomas was born in the Welsh seaport of Swansea, Carmarthenshire, Wales, on October 27, 1914. His father, David John, was an English teacher and a would-be poet from whom Dylan inherited his intellectual and literary abilities. From his mother, Florence, a simple and religious woman, Dylan inherited his mood, temperament, and respect for his Celtic heritage. He had one older sister, Nancy. He attended the Swansea Grammar School, where he received all of his formal education. As a student he made contributions to the school magazine and was keenly interested in local folklore (stories passed down within a culture). He said that as a boy he was "small, thin, indecisively active, quick to get dirty, curly." During these early school years, Thomas befriended Daniel Jones, another local schoolboy. The two would write hundreds of poems together, and as adults Jones would edit a collection of Thomas's poetry. After leaving school, Thomas supported himself as an actor, reporter, reviewer, scriptwriter, and with various odd jobs. When he was twenty-two years old, he married Caitlin Macnamara, by whom he had two sons, Llewelyn and Colm, and a daughter, Aeron. After his marriage, Thomas moved to the fishing village of Laugharne, Carmarthenshire. United States—the others were in 1952 and 1953—in which he gave more than one hundred poetry readings. In these appearances he half recited, half sang the lines in his "Welsh singing" voice. Thomas's poetic output was not large. He wrote only six poems in the last six years of his life. A grueling lecture schedule greatly slowed his literary output in these years. His belief that he would die young led him to create "instant Dylan"—the persona of the wild young Welsh bard, damned by drink and women, that he believed his public wanted. When he was thirty-five years old, he described himself as "old, small, dark, intelligent, and darting-doting-dotting eyed … balding and toothlessing." During Thomas's visit to the United States in 1953, he was scheduled to read his own and other poetry in some forty university towns throughout the country. He also intended to work on the libretto (text) of an opera for Igor Stravinsky (1882–1971) in the latter's California home. Thomas celebrated his thirty-ninth birthday in New York City in a mood of gay exhilaration, following the extraordinary success of his just-published Collected Poems. The festivities ended in his collapse and illness. On November 9, 1953, he died in St. Vincent's Hospital in New York City. Some reports attribute his death to pneumonia brought on by alcoholism, others to encephalopathy, a brain disease. His body was returned to Laugharne, Wales, for burial. Thomas published his first book of poetry, Eighteen Poems (1934), when he was not yet twenty years old. "The reeling excitement of a poetry-intoxicated schoolboy smote the Philistine as hard a blow with one small book as Swinburne had with Poems and Ballads, " wrote Kenneth Rexroth. Thomas's second and third volumes were Twenty-five Poems (1936) and The Map of Love (1939). The poems of his first three volumes were collected in The World I Breathe (1939). By this time Thomas was being hailed as the most spectacular of the surrealist poets, or poets who used fantastic imagery of the subconscious in their verse. He acknowledged his debt to James Joyce (1882–1941) and dotted his pages with invented words and puns (the use of two or more words that sound the same, usually for humorous purposes). Thomas also acknowledged his debt to Sigmund Freud (1856–1939), stating: "Poetry is the rhythmic, inevitably narrative, movement from an over clothed blindness to a naked vision.… Poetry must drag further into the clear nakedness of light more even of the hidden causes than Freud could realize." A Portrait of the Artist as a Young Dog (1940) is a collection of humorous autobiographical (having to do with writing about oneself) sketches. Thomas loved the wild landscape of Wales, and he put much of his childhood and youth into these stories. He published two more new collections of poetry, both of which contained some of his finest work: Deaths and Entrances (1946) and In Country Sleep (1951). Collected Poems, 1934–1953 (1953) contains all of his poetry that he wished to preserve. Thomas claimed that his poetry was "the record of my individual struggle from darkness toward some measure of light.… To be stripped of darkness is to be clean, to strip of darkness is to make clean." He also wrote that his poems "with all their crudities, doubts, and confusions, are written for the love of man and in praise of God, and I'd be a damned fool if they weren't." Passionate and intense, vivid and violent, Thomas wrote that he became a poet because "I had fallen in love with words." His sense of the richness and variety and flexibility of the English language shines through all of his work. The theme of all of Thomas's poetry is the celebration of the divine (godly) purpose he saw in all human and natural processes. The cycle of birth and flowering and death, of love and death, are also found throughout his poems. He celebrated life in the seas and fields and hills and towns of his native Wales. In some of his shorter poems he sought to recapture a child's innocent vision of the world. Thomas was passionately dedicated to his "sullen art," and he was a competent, finished, and occasionally complex craftsman. He made, for example, more than two hundred versions of "Fern Hill" before he was satisfied with it. His early poems are relatively mysterious and complex in sense but simple and obvious in pattern. His later poems, on the other hand, are simple in sense but complex in sounds. Under Milk Wood, a radio play commissioned by the BBC (published 1954), was Thomas's last completed work. This poem-play is not a drama but a parade of strange, outrageous, and charming Welsh villagers. During the twenty-four hours presented in the play, the characters remember and ponder the casual and crucial moments of their lives. Adventures in the Skin Trade and Other Stories (1955) contains all the uncollected stories and shows the wit and humor that made Thomas an enchanting companion. Brinnin, John Malcolm. Dylan Thomas in America. New York: Paragon House, 1989. Ferris, Paul. Dylan Thomas: The Biography. Washington, DC: Counterpoint, 2000. Fryer, Jonathan. Dylan: The Nine Lives of Dylan Thomas. London: K. Cathie, 1993. Goodby, John, and Chris Wigginton, eds. Dylan Thomas. New York: Palgrave, 2001. Thomas, David N. Dylan Thomas: A Farm, Two Mansions and a Bungalow. Bridgend, Wales: Saren, 2000. Thomas, Dylan. Portrait of the Artist as a Young Dog. Norfolk, CT: New Directions, 1940.